Compared to previous versions, where call outcomes were assigned to the contact itself, in IdSurvey 7 the outcomes are managed separately for each number of the contact. For example, when the interviewer selects the “Incorrect Number” outcome, IdSurvey assigns the outcome to the number that was actually used for calling, leaving the other existing numbers of the same contact available to be called at later times. 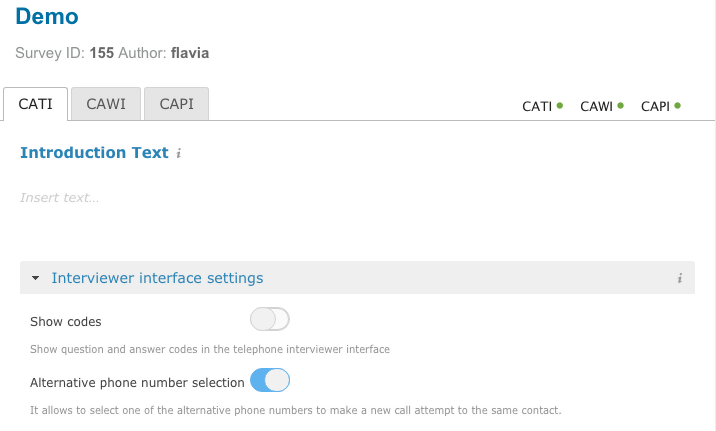 In the interviewer interface, therefore, a single phone number is always showed. Normally, after completing the interview or after selecting any outcome (for example: “Busy Line”), IdSurvey would show the next contact. If the option “Alternative Phone Number Selection” is enabled, the interviewer will be able to try and call another existing number of the same contact. This mode allows to emulate the behaviour of the previous IdSurvey versions. It will be mandatory to select an outcome for each attempt at different phone numbers of the contact. The interviewer can schedule an appointment with any existing number of the same contact. All the call outcomes are tied to the single phone number, except for the “Refused” outcome, which is assigned to the contact to exempt it from further callings. 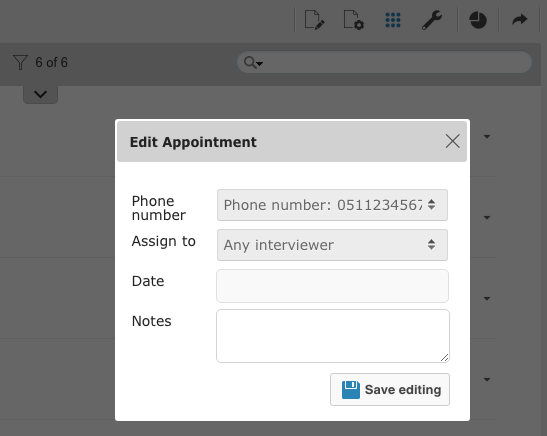 The “Edit appointment” function, available for each contact in the “Contacts Management” page, now allows to specify the phone number for that appointment. The limit to call attempts (in the CATI survey settings page) now refers to the total of the attempts for a single contact, and is therefore based on the sum of the attempts for each number of a single contact. Just like in previous versions, IdSurvey allows for a maximum of 4 phone numbers to be uploaded. The prearranged fields are NewPhoneNumber, Mobile, PhoneNumber and OtherPhoneNumber. In the CATI settings page you can change the priority that IdSurvey uses to show numbers to the agents, inside the “Call Settings” box. Inside the “Contact Options” box, you can also specify if you want to show the contacts using the uploading order or randomly.